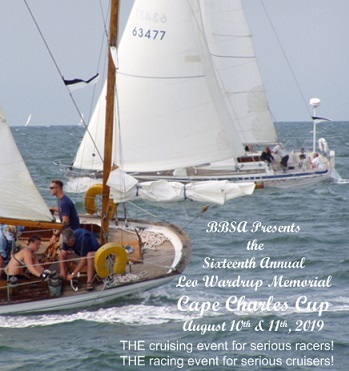 Sponsored and organized by BBSA, the Leo Wardrup Memorial Cape Charles Cup is on for August 9-11, 2019 so mark your calendars now. This 2-day distance racing event with its overnight destination of Cape Charles is unique to racing in the southern Bay. Both days are part of the Southern Bay Distance Racing Series (SBDRS). This race attracts racers from up and down the bay and has PHRF and cruising classes. Go to the Documents page for the Notice of Race, Sailing Instructions and other documents as they are released. The event also enables BBSA to make a contribution to Sail Nauticus, to support the sport of sailing and the development of young sailors. There are many raffles and silent auctions going on during the festivities to give you a chance to win prizes and support our donation. It is the cruising event for serious racers and the racing event for serious cruisers. There is truly something for everyone. The overnight in Cape Charles includes a fantastic party at the Oyster Farm Marina at King's Creek, including great food, music, dancing, first day awards, and camaraderie with fellow racers. Plus get ready for another day of exciting racing back to Buckroe Beach on Sunday. There are daily and overall winners, so anyone can win. For details on an event listed above, click on the event title. For more information about all events, go to the CCC Calendar page. $50 for first time registrants. $115 if you register and the payment is received by July 16th, 2019. $165 for registration payments after July 16th, 2019. Visit our Register page for entry details. Daily class awards are based on the number of entries in your class. There are also Cape Charles Cups for the best total corrected time in PHRF, Cruising, CMA/Multihull, and CRCA classes (13 boat minimum). Keeper trophies are traditional big brass Weems and Plath yacht lamps. Winning boats earn their names on the perpetual trophy awarded at the final party at the September BBSA meeting. Great Cape Charles Cup tee shirts (long/short sleeve and women's versions), tech shirts (men's & women's), hats, skipper's bags and extra dinner tickets are available for purchase on the entry form. Order early as these tend to run out. If you have crew that need accommodations, there are some options available. Check with our coordinators and make reservations early. The race doesn't happen by magic. If you want to help with the race, volunteers are welcomed. Go to our Volunteers page and you can post your availability to the Forum or you can send a private email to the CCC Contacts. If you are a BBSA member, you can also look at their contact information and call them. Marina options include Oyster Farm and Cape Charles Harbor. If you are a deep draft boat, Cape Charles may be your better option unless you want to wait for the tide. There will be transportation provided between the two venues. Oyster Farm: This is the location of the party and award events on Saturday. You will need slip reservations if you plan to stay here and you need to be entered in the race in order to make reservations. Your slip will be assigned prior to the race. Once you register for the race, wait 3 days to make your slip reservation. Also you must pay for your slip prior to departing for the second leg of the race. Cape Charles Town Harbor: This is your deep draft option. Enjoy race hospitality at the Town Harbor with a post-race host boat as well as Sunday morning munchies. There will be a fast reliable shuttle service on Saturday evening between the Harbor and Oyster Farm.